Display Merchandise Recoilers, Pull Box, Pullbox , Pullboxes, Pull Box Recoilers, Pull Box Recoiler, Merchandise Recoiler, Tether Systems, Recoiler Loss Prevention, Anti-shoplifting, Retractable Cable.are it's alias. This is a small reel suitable for table top displays. For the situations there won't be very high requirement on cable retraction force, this would be the most economical choice. We believe, Professional, make excellent products, choose us, choose the Well Guard. If you need more details about our products, please send email to us, we will do our best to help you. Recoiling Tether for Mobile Phones, Retail Loss Prevention, Retail Security Tags , Retail Security Labels, Retail Security, Mobile Phone Display, DisplayMaster Merchandise Recoiler, Pull Box Merchandise Tether, Mechanical Retractor, Security Pull Box, Security Recoiler, Merchandise security tether, retracting security cable, retracting display cable, Cord Reels, Reels, Protex Retractor, Retail Theft Control, Mechanicail Retractor, Anti-shoplifting Recoilers, Tethers,Retractors, Recoiler, Tethers, Retractable Pull Boxes. 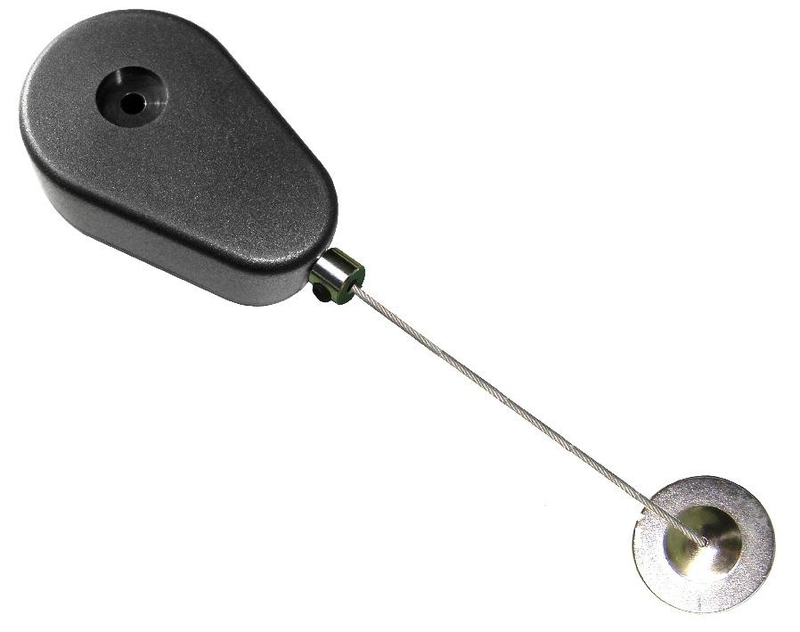 vGuard™ is a leading designer and manufacturer of the vG-PB094 retail security tethers. The vG-PB094 is a compact, attractive way to deliver theft-deterrence and customer convenience for point-of-purchase (POP) displays. These products are also referred to as store display security tethers, security cable retractors and store display recoilers. Featuring the heaviest cable available in a retail security tether, the vG-PB094 has a small, low-profile case that holds the retractable cable. It can be mounted on the inside or outside of a display as a functional and aesthetic component of an effective point-of-purchase display presentation. With seven designer colors available, the vG-PB094 display security tether blends in with any display to create a positive, interactive customer experience. It is particularly well-suited for use with mobile phones and other products of similar size. 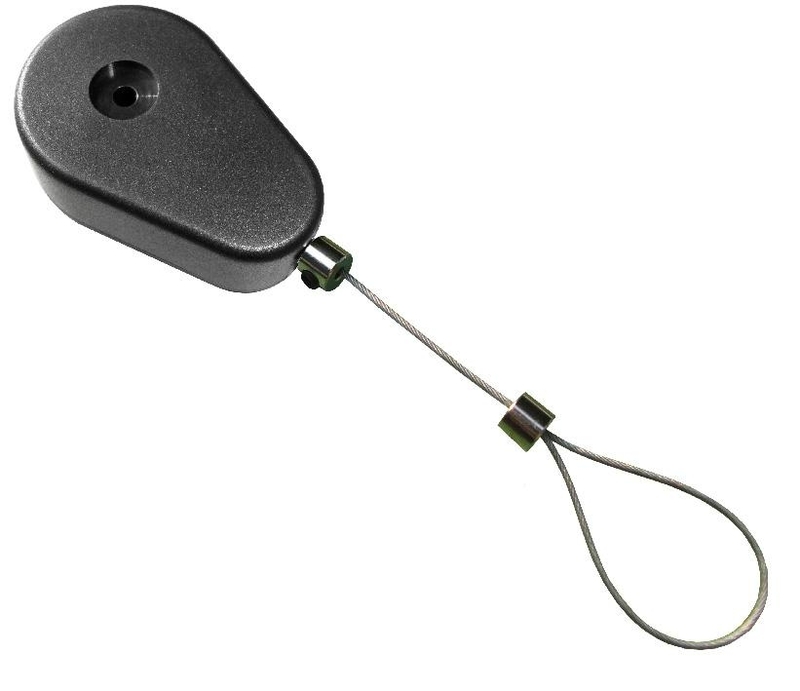 vGuard™ 's vG-PB094 retail security tethers are rugged and designed for maximum life in demanding store display use. There are many options for the cable, end fitting, and box. If you do not see an option that you require, please send us an e-mail and we will address your request, or order a stock vG-PB094. vGuard™ offers 2 stock vG-PB094 security tether products that can be purchased online. All units are fully assembled and ready to use. The vG-PB094-P1T has a 36 inch (914.40 mm) extension with 0.25 lb. (0.11 kg) pull force. The end detail is 0.88" (22.23 mm) x 1.38" (34.93 mm) metal plate with tape. The vG-PB094-P2T also has a 36 inch (914.40 mm) extension with 0.25 lb. (0.11 kg) pull force, but the end detail is a .196" (4.978 mm) ring terminal. 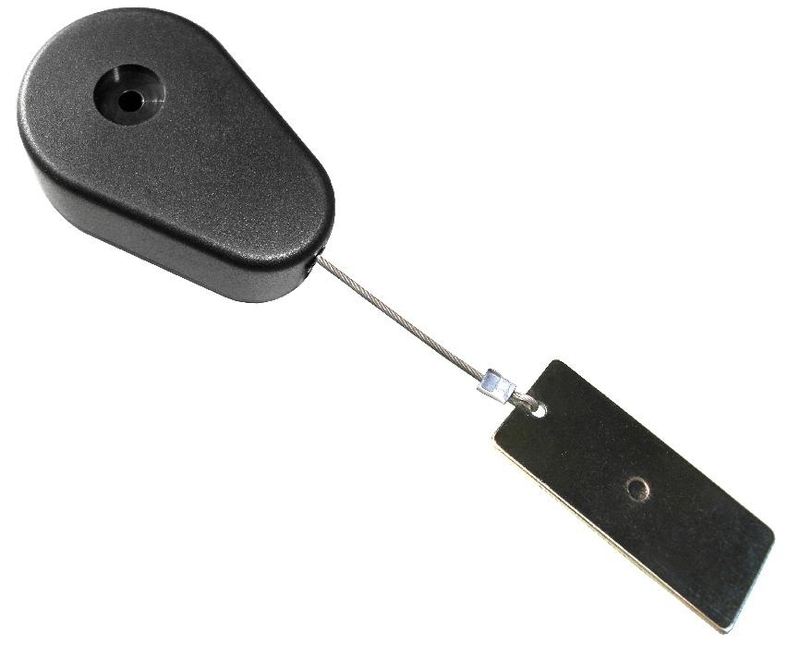 For many applications, a stock retail security tether will do the job. Where a custom retail security tether is necessary, vGuard™ Spring works with customers to engineer a custom solution, often using a stock retail display security tether as a starting point for the new design or prototype. vGuard™ can offer design and engineering support for early-stage product development or can simply provide a quote for the desired quantities of fully-engineered and ready-to-use retail security tether. vG-PB094 dimensions are shown in drawing. There are many options for the cable, end fitting and box; complete the vG-PB094 specification form for all custom requests. 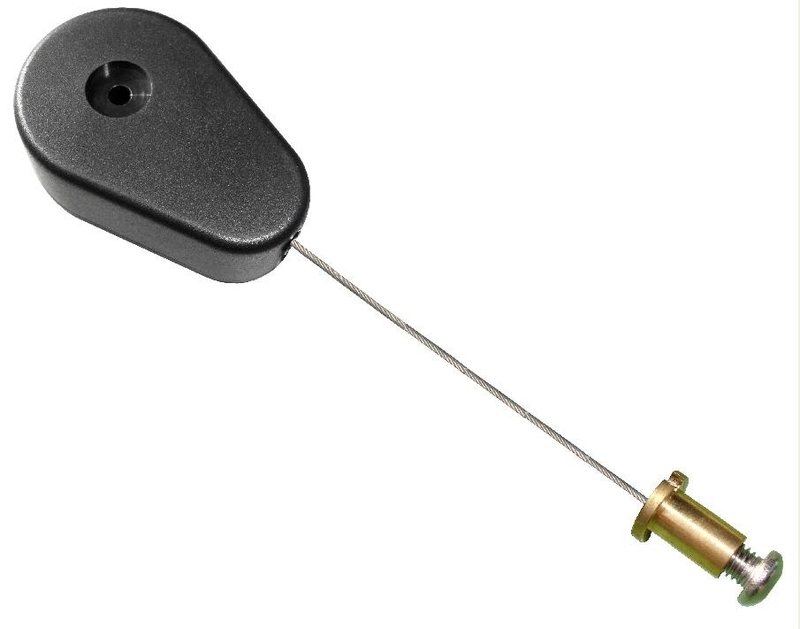 vGuard™ Spring utilizes highly customized production equipment, lean manufacturing techniques and principles, and ISO 9001:2008 certified procedures to provide our customers with a streamlined and efficient manufacturing process to produce vG-PB094 retail security tethers. Benefits of working with vGuard™ Spring include reduced lead times, high quality control and highly competitive costs. 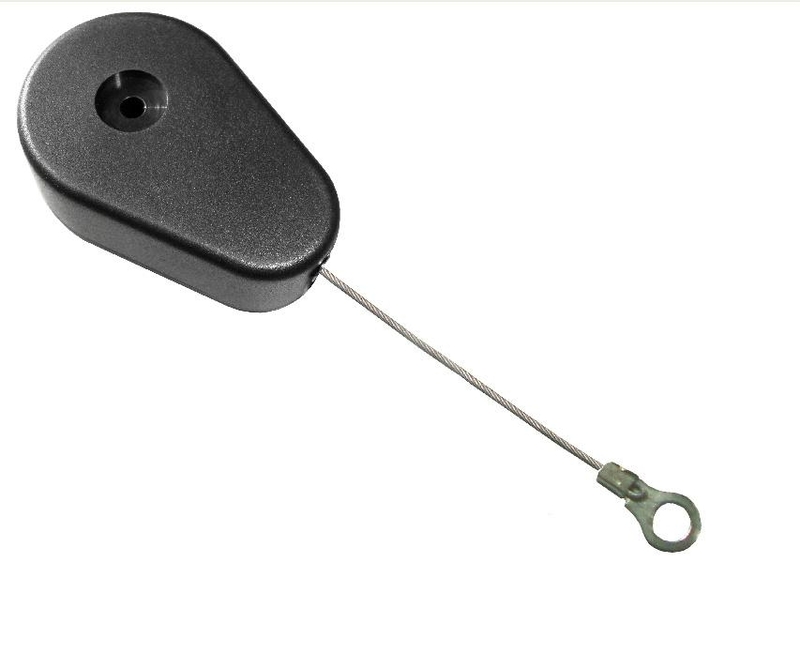 Customers can buy stock retail security tethers online or complete the vG-PB094 specification form or further assistance with retail security tethers from vGuard™.